You are here: Home / News / staff news / Reclaim & reuse! “Before any piece of clay is put on the potter’s wheel, we must ensure it is the correct state for our customers to throw their creations with. We do this by wedging the clay. Wedging, or kneading the clay, involves using your hands to roll the inconsistent clay in a smooth motion. By doing this we are pushing out any air bubbles that may be hidden in the clay, air bubbles can crack customers pots or be dangerous to put into the kiln. Another reason we wedge is clay is to make sure it is the right consistency to throw with. It would be almost impossible to create a pot on the potter’s wheel with a piece of clay that is too hard or too soft! We never waste any clay in the pottery. The bits that fly off during centering, the leftover parts from a pinch pot, the soggy stuff you find at the bottom of buckets, all unused clay is collected together and wedged back into a nice consistency for the next person to use. 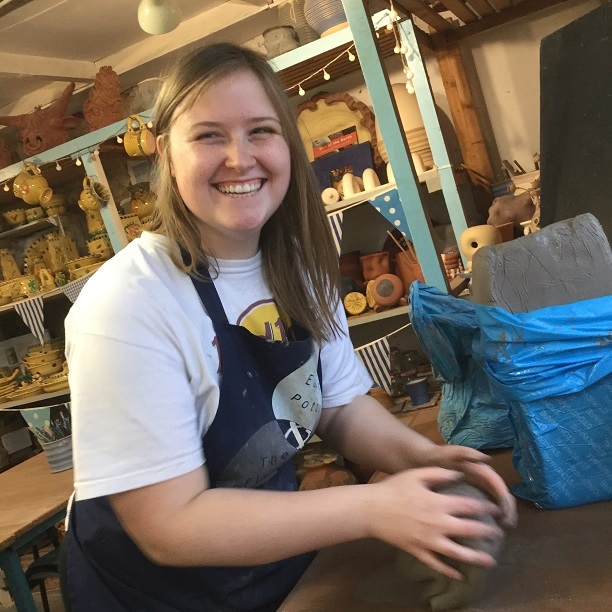 http://eastnorpottery.co.uk/wp-content/uploads/2019/03/immy-wedging-clay-at-eastnor-pottery-1.jpg 612 612 admin http://eastnorpottery.co.uk/wp-content/uploads/2019/03/eastnor_pottery_header_2019-3.png admin2019-03-18 14:32:112019-03-20 00:39:20Reclaim & reuse!